Are you ready for some action? Energize yourself at WOOP! Built by the famous Dunking Devils acrobats, the WOOP! trampoline park, Slovenia’s biggest, will open its doors on December 1st 2017. The park will offer more than 100 trampolines and other sports attractions as a new way of socializing in a healthy, active way. It will also be suitable for all ages and every generation. In addition to the free jumping trampolines, a 3,500 square metres space will also offer an adrenaline polygon, slackline, trapezoid, inflatable cushion, gymnastics pit with foam, trampoline wall, basketball basket for towing and an interactive playing wall. In the middle of the city’s shopping mecca just 5 kilometres from Ljubljana’s Old Town is where the trampoline park can be found. After a visit to the park, its shopping centre surroundings offer plenty of other options for activities to spend your day on. WOOP! park can accommodate 120 people at a time and will be the spot where children’s birthdays, school and kindergarten sports days, teambuilding activities and company incentives will be organised. At weekends, special themed evening programmes will be held between 20:00 and 23:00 that will provide companies with an excellent opportunity for innovative “after-work” socializing. 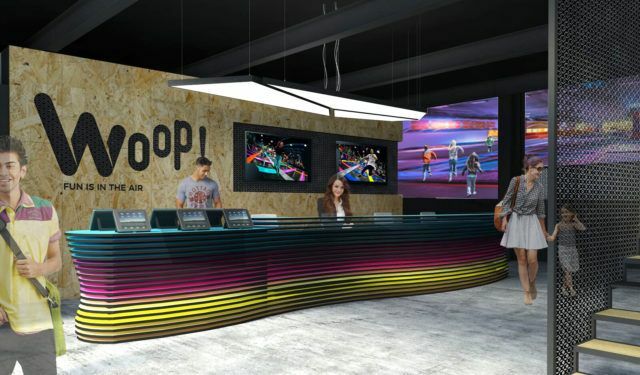 At WOOP!, one can rent the professional section of the trampoline park that includes first-rate acrobatic equipment designed to train professionals and anyone else who wants to upgrade their acrobatic skills. Activities in the professional part of the park must be guided by qualified personnel, which can also be provided by WOOP! park. On the first floor of WOOP! park there is a shop where you can buy drinks and snacks, and by prior arrangement the trampoline park team is happy to organise catering to client requirements. They say that an input in employees is an input in success, so from January 2018 onwards teambuilding sessions will also be organised at the WOOP! park. The programme will take about 3 hours, but before it starts a number of goals will be set, as each programme will be tailor-made for the specific team. In addition to WOOP! teambuilding, a “Team UP!” teambuilding will also be running in the park, which has for some years already been successfully carried out by the Dunking Devils acrobatic group. Team UP! is a teambuilding activity that has a successful sports team inspire members of a business team to recognize and start consciously tapping into their personal and team potential.